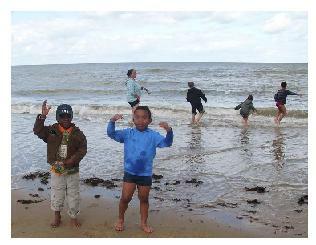 What beach crafts do you think kids will enjoy on a day out to the beach or on a holiday by the ocean? A hit with our party was to make an activity sheet with projects to do when they arrived there, and to finish off when they got home. You will see what kids crafts we can make from collected items using an activity sheet. When we arrived at the beach, there were questions on how many shells, seaweeds and pebbles in their different colors they could find, and they were supplied with polythene bags to put them in. All the children, the young as well as the older ones were enthusiastic and gathered many of the items. We ended with a sea quiz on the train journey back home and there was a framed box at the bottom of the page for them to make a drawing of their day at the seaside. What will you have on your activity sheet? 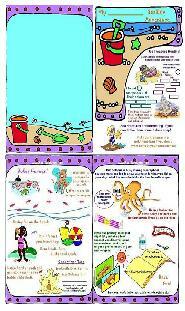 Above is an updated version of the Kool Kids Crafts activity sheet which you can download ready for the summer vacation. Just sign up for our CraftsWork Newsletter and Printable Downloads to get access to it. Print sheets 1 and 4 on one side of paper and sheets 2 and 3 on the other side. Shell collecting is one classic pastime that everybody seems to enjoy. But what happens to those shells when you get them home? Use them for seashell crafts! With a bit of glue, some beads, seeds, and pretty pebbles from the seashore, get those shells out and make some mini sea-creatures! See how I made use of the ones below in my seashell crafts project. 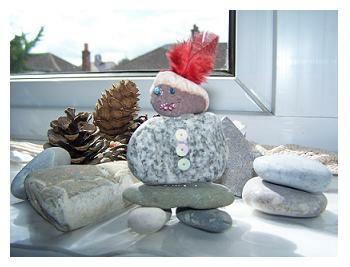 See our Beach stone granny! We think the head stone is great with its distinctive color seam. It gave us the hat and face. We added tiny beads for the eyes and mouth. We put sequins which look like buttons on the body made of marble stone and topped her off with a feather in her hat. Later we added a swirly seashell that looks like a hair bun. This granny gently rocks back and forth without falling over like she was in a rocking chair. That was just a fluke, an added bonus! Some of the children may have visions of greater things and insist on bringing rocks home to make beach crafts. Well there`s nothing wrong in that! You can do a lot with rocks as longs as you`re not the one carrying them home! They make great octopus door stoppers, garden ornaments when painted and decorated with shells, or decorated souvenir paper weights from "such and such" resort scribbled all over them. Get creative with Kool Kids Crafts! Seaside art and seaweed pictures can be created with the seaweed you collect. That`s what they were supposed to be doing here. Either you can spread them out and wait until they dry to use as models for drawings or press them onto poster board to create a seaside collage. Stick on some fish made from shiny colored papers for effect against a blue or green background for a deep sea scene, or on a cream background will cutouts of starfish, crabs, shells and a bit of golden or silver glitter for a beach scene. Sand Art comes in many forms and sand painting using an array of colored sand was on our kids crafts agenda. It turned out to be successful, despite the difficulty getting the sand to do what you wanted it to. Have some fun doing this kind of sand art and look out for more ideas as we test them out. I suggest a scrap book to capture the memories. The kids will cherish them in years to come and you will too. Kids, what items can you collect to make your own scrapbook? You will need to keep the idea in mind when you`re collecting things for your beach crafts, but think! You can`t put shells in a scrapbook! Mum, let them borrow your camera just to take a few interesting pictures for their scrapbook. Please! Look out for funny postcards and save the tickets from the funfair rides. Make cut-outs from any sweet packaging such as seaside rock candy. You can also buy scrapbook die cuts with a seaside theme for your scrapbook or use them to make postcards before you go on holiday and then post them when you get there. That`s a unique idea from Kool Kids Crafts! We have added it to page 3 of the Seaside Project sheet. We can talk about beach bags later when I post some sewing craft ideas. Hope you like sewing. Have a nice day at the seaside and enjoy making your beach crafts!